Lift Stations, PRV's, Hydrants and much more! Let the Alabama Rural Water Association (ARWA) help you manage your utility's critical assets in the field. Utilizing "State of the Art" GPS Equipment and the latest in GIS Software, the ARWA can create a database inventory of all of your critical assets which will allow you to track the age, in most cases of your critical components, to make replacement cost projections, and to better manage your utility with the utmost efficiency. The ARWA has personnel with over ten years experience in data collection and management. ARWA services will not be rendered by a licensed surveyor. The ARWA does not offer this service as a licensed surveyor or professional engineer. The ARWA will provide asset field data collection services utilizing GPS equipment to inventory critical asset locations and provide coordinates of visible assets including (valves, hydrants, meters, trenches, markers, etc., as identified by the client). The accuracy of ARWA's data collection equipment has been tested to sub-meter accuracy. The equipment to be used by ARWA includes the following: Trimble Geo XT Standalone GPS and data collection device. The unit has H-Star technology and integrated real-time SBAS and EVEREST multipath technology. It has 512MB of non-volatile Flash memory plus removable SD memory. The ARWA can produce paper maps of critical components printed on the highest resolution aerial photography available from the ArcGis Online Database. 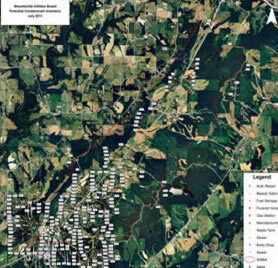 A draft copy of the maps will be provided for editing and review prior to final publication. The maps can be printed in large-scale, typically 36" by 36", showing the major features with layers as desired (roads and streets, sections, railroads, rivers and streams, etc). Maps can also be generated into a map book format. The typical page is an 18" by 24" high quality, high-detail booklet that can be easily disassembled so any page can be replaced with an update. The ARWA can provide maps published in digital format. The ARWA will assist the utility with the installation of the currently free ArcExplorer program for viewing. 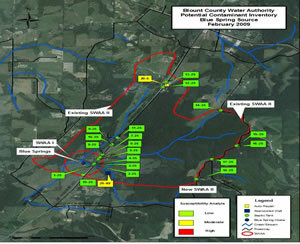 This allows utility personnel to view and print portions of the map. Feature attributes, details such as size and date of installation, can be added and edited with additional programming. Call, email, or complete the request below for your free quote. The dollars you save in replacement costs and more efficient management can help you meet budget deficits and build the reserve accounts necessary for operational needs or emergency situations. Yes, I would like additional information! Don't Settle for Out-dated Maps! How accurate are your utilities records and maps? What is GIS and why is it important? A geographic information system (GIS) integrates hardware, software, and data for capturing, managing, analyzing, and displaying all forms of geograph-ically referenced information. GIS allows us to view, understand, question, interpret, and visualize data in many ways that reveal relationships, patterns, and trends in the form of maps, globes, reports, and charts. It organizes your information so that management can more effectively manage.